End of Summer is drawing near. That means back to school shopping. Clothes and supplies. Or if your kids are done with school, more extra cash for you. I hope you all had a wonderful summer. Enter our giveaway and you choose how you get your prize. Amazon or Paypal. I use Amazon all the time. Especially with Amazon Prime and fast shipping. How to enter: There are 10 Instagram accounts. Follow one or all but the more accounts you follow the more entries you’ll receive. If you’re already a follower of an account, claim that entry! This giveaway starts August 15 at midnight EST and ends August 31 at 11:59 PM EST. Entrants must be USA residents and at least 18 years old. One winner will be randomly selected from all qualifying entries and contacted via the email they provide. The email will come from joannegreco at gmail. The winner has 48 hours to respond or a new winner will be chosen. 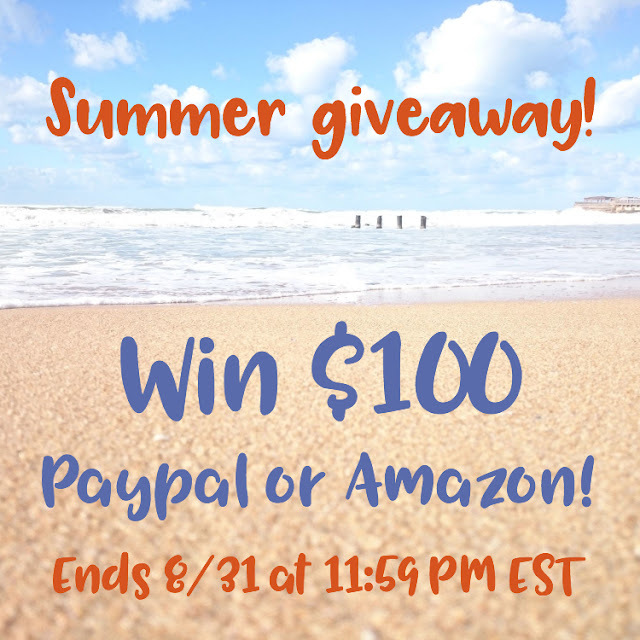 The prize is $100 in Paypal or Amazon online gift card, winner’s choice. How would you spend your prize money? Thanks for sharing! Love these blogs. Thanks for sharing, love this blog. Thanks for sharing, love this blog!